Welcome to Norfolk! A11 dual carriageway ready by 2014 Alan Partridge to close Cromer Pier! I regard my annual subscription to the National Trust as being money very well spent. Apart from the free admission and parking that membership provides I also use the great houses and estates cared for by the Trust as my upmarket motorway service areas. There are now so many National Trust properties dotted about the UK countryside that one is almost certain to be found close to the route of any long car journey. A short diversion off the main road will take you to lovely surroundings where you will find clean toilets and a decent restaurant. Well fed and relaxed you can then continue your journey. 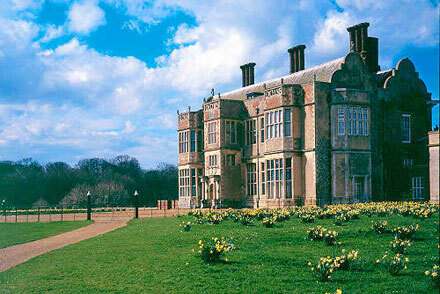 Advertisement for the National Trust now over I will tell you about North Norfolk’s Felbrigg Estate. I like Felbrigg Hall very much. The house, it has to be said, is not as impressive or beautiful as Blickling Hall, due mainly to some modern additions over the years, nevertheless as you drive through the Cromer Lodges’ archway onto the main drive I am sure that you will not be disappointed with what lies ahead. As you drive along with the fringe of the Great Wood to your right, and the grazing meadows to your left, you will see the church of St Margaret nestled in a dip ahead of you. The village that once surrounded the church vanished long ago and apart from the trees that keep it company it now stands alone. It is worth visiting the church for its brasses and the memorials to the Felbrigg and Windham families who owned the estate at different points in its history. The interior of the house itself is very interesting but not spectacular. The dining room and the kitchen are perhaps the most interesting features. The team of gardeners maintain the walled garden to a very high standard. It is beautiful, particularly in spring and high summer. In the autumn the espalier fruit tress attached to the walls are full of fruit. In the top part of the garden there is a large dovecote of red brick, some glasshouses and a central pond. Chickens also feature and are running loose in the garden. When there are chicks around they are a great attraction for visiting children. Some of the vegetable plots are allotted to local applicants that tend them each year. The plots are highly sought after and the quality of the fruit and vegetables produced is very high. The orchard adjoins the garden and is accessed through a gate near the dovecote. There are some beehives in a corner of the orchard. 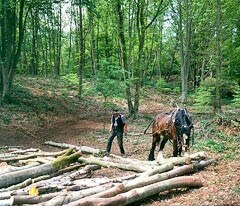 Walking in the Great Wood is a joy at any time of the year. Take the circular walk around the lake. From the car park make for the church and then turn to the right. Follow the path around the lake and turning right will then bring you back to the car park. Ice cream van in the car park area. Great when you arrive back after a walk. The Lion’s Mouth is a narrow winding road leading from the main A148 Cromer to Holt road down past the rear entrance to Felbrigg Park. There are some lovely and very old hardwood trees in the woodland on each side of the road. Good spot for picking up chestnuts in the autumn. Dogs are welcome. Be watchful though as there is often livestock roaming free in the parkland. Check the opening times as they vary with the season. They are available at the National Trust website.